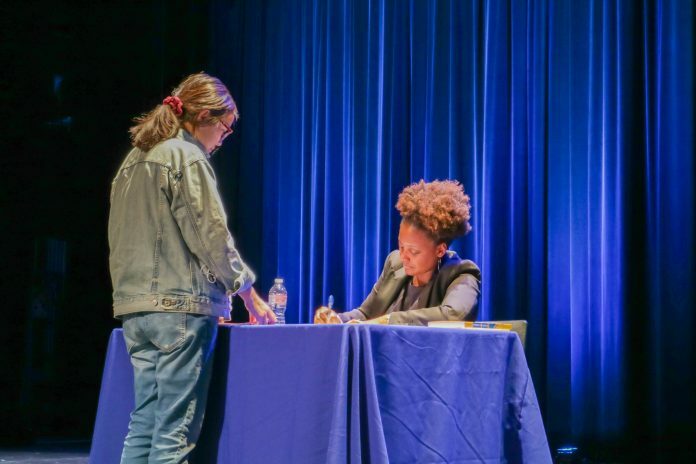 Tracy K. Smith, the current United States poet laureate, stopped by Campbell Hall on the evening of Jan. 31 as part of her ongoing campaign to bring poetry and its messages across the nation. Smith is currently a professor and Director of Creative Studies at Princeton University, and is serving her second term as the United States Poet Laureate. She has published four books of poetry: Wade in the Water, Life on Mars, Duende, and The Body’s Question. Alongside her award-winning poetry collections, Smith has also published a memoir titled Ordinary Light. Her audience that night, consisting of tired yet eager college students as well as adults of a more advanced age, represented a diversity in backgrounds. Though this group of people seemed to have little in common, they all came together that night to listen to poetry. The poems read that night included Smith’s own works and those of other poets. Everyone in the audience sat still in their seats, paying rapt attention as Smith read line after line. Her voice was smooth, calming, and did not waver even when the words she delivered were filled with grief and loss. The topics of poetry showed vast range — from hate crimes toward different ethnic groups and attitudes on immigration in the United States, to dealing with the death of a close loved one. Even throughout the changing themes, Smith’s talent for narration never failed, consistently bringing to life the story behind each one. “To find that those words could fit in my mouth was uncomfortable,” Smith said. As poet laureate, Smith recently toured in many rural areas around the country as part of her “American Conversations” initiative to spread poetry to diverse communities. To follow her chronicles of her experiences on the road, visit her “American Conversations” website.